Leopard lizards, also called leopard geckos, are endemic to Afghanistan, India and Pakistan. They grow between 8 and 9 inches long. Leopard lizards are resilient creatures that make ideal pets because they can be left alone to fend for themselves for a few days at a time and require minimal care. Leopard lizards subsist on a diet of insects. These can be purchased at pet shops and include crickets, mealworms, Dubia roaches and wax worms. Leopard lizards also need calcium and other vitamins to remain healthy. In captivity, it's more difficult for them to assimilate the necessary amounts of calcium and vitamins from their diets alone. Therefore, owners are encouraged to dust insects with calcium powder so your lizard can absorb the nutrients. You can also feed live insects foods rich in calcium and vitamins, such as oatmeal, squash and kale, before feeding them to your lizard. This process is referred to as gut loading. 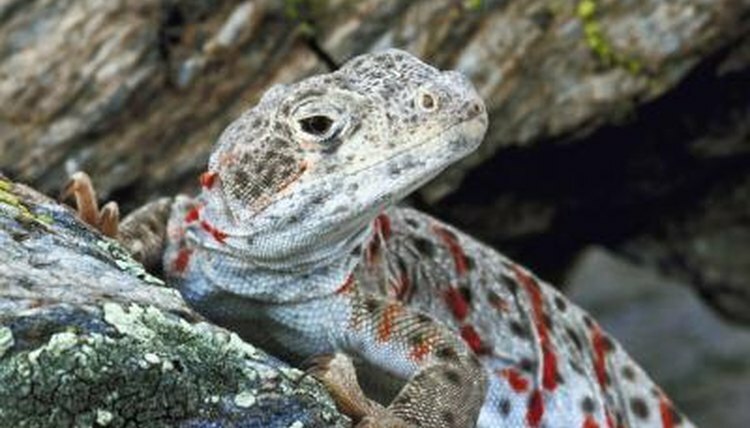 Purchase calcium and vitamin powders specifically formulated for your leopard lizard at pet supply shops. Your lizard can assimilate calcium very well, so you should dust with calcium powder two to three times a week. If you use vitamin powder, however, you should limit to once a week so you don't overdose your lizard. The leopard lizard breeding season is fairly generous. It runs from January through September and sometimes extends through October. A male reaches sexual maturity at nine months, but handlers recommend you wait until he turns one before breeding him. All it takes is one male and one female to get things cooking. Keep the couple together in one tank for one week. Some breeders put at least three females in with the male to ensure success – only do this if the tank accommodates all the lizards comfortably. During mating the male leopard lizard follows the female and bites her on the back and neck. After he bites her, he mates with her – a process that takes only a few minutes. It's important to not interrupt them, unless you observe that he's doing serious damage to her. When he is finished mating with her, take him out of the tank so the female can de-stress. Females retain the sperm, so the chances for successful egg fertilization from the one coupling are high. Give your pet leopard lizard plenty of space to live. A 10-gallon tank that is at least 1 foot tall is ideal for one lizard. In it, recreate the lizard's natural habitat as best you can. Add stones for it to hide under, and substrate. Also include a hide box filled with moist moss, so the lizard can go in to when it sheds its skin. Place a heating pad under your leopard lizard's tank. Avoid using heat rocks, because there is a risk that you will burn your pet lizard. The room in which your pet lizard's cage is located should always be at least 73F.